Superior clean offers a specialist, professional Wirral curtain dry cleaning service for domestic and commercial customers. To arrange a free, on-site curtain dry cleaning survey call on 0151 513 7537 now. Because hot water extraction cleaning can cause shrinkage in curtains and drapery, we only clean curtains using a purpose built, curtain dry cleaning machine. All curtains are cleaned in-situ – no need to take them down off the rail and therefore no loss of privacy. The solvents used by Superior Clean are non-abrasive and family and pet safe. There is no harsh rubbing involved so there is no risk of damaging your curtains during cleaning. The scientifically proven cleaning solutions are applied to your curtains under low pressure, soaking into the material and breaking down the soil. The excess cleaning agent is then extracted from the curtains along with the soiling it has loosened. Normally dry within a couple of hours, your curtains will be dust free, clean and bright in no time. 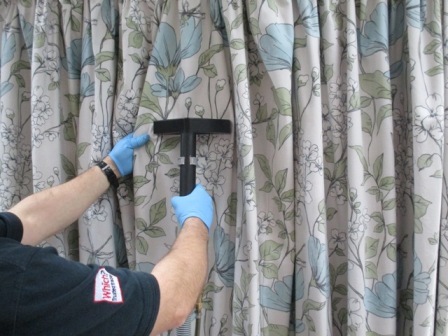 Using this system we can safely dry-clean all types of curtains. For a professional curtain dry cleaning survey, Call Peter Now on 0151 513 7537. To find out how your curtains can benefit from having a stain protection treatment applied after cleaning Click Here. Really pleased with the excellent job.